The picture below shows the configuration setup so that the on Click command prompts the write dialog where the user can write a value in the range of 0 to 150. The resulting value will be multiplied by 3 and increased by 33 before writing to the PLC as a result of the Scale/Offset addition. Additionally, you can add a Title text, which will display during visualization in the dialog window when using the Write/Set command. If you want no confirmation message to be displayed upon the write action, unselect this field. 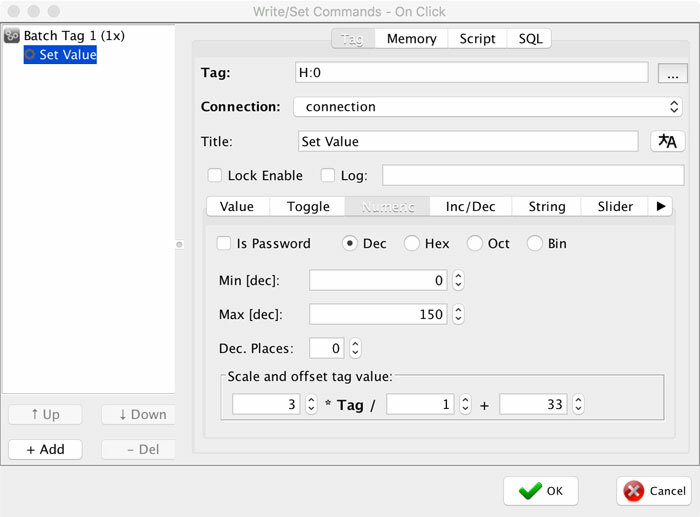 If you want to log the write command into the data-log, check the Log check box and fill in the message field.